"Set on one of the most coveted streets in Glendale stands this 1923 Mediterranean trophy estate. Extremely private 5,142 sqft house, a detached 818 sqft guest house & a 3-car garage on a 34,000+ sqft lot. This is an entertainer's dream. Period details at every turn this showcase home boasts large entertaining spaces, an oversized regal formal LR with period French doors & a decretive fireplace. High ceilings throughout, with a grand DR perfect for large dinner parties, a large kitchen fully equi"
"Spectacular architectural compound w/ jaw-dropping jetliner views all the way to downtown. This 1960 Mid-Century masterpiece features period details at every turn. 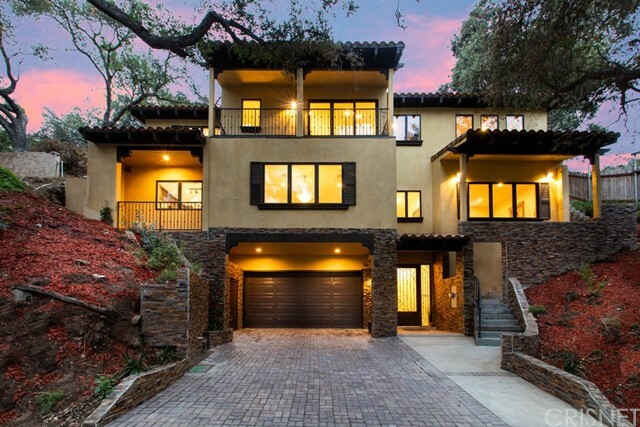 Completely updated this 3,682 Sf home features soaring pitched ceilings, walls of glass that highlight the mesmerizing views of the city. 3 private bedrooms all w/ views & updated private baths including a master suite on the lower level w/ a sitting room/office & a designer finished bathroom w/ a soaking tub, period lighting & walk-i"
"Be the first to live in this brand new Modern Mediterranean Chevy Chase Estates home. No expense was spared creating this showcase property. From the luxurious foyer you can take the stairs or a private elevator to an expansive living room & kitchen with exquisite Carrera Porcelain tile floors. The open floor plan & 10 foot ceilings allow an abundance of light to spill in. Gazing through the JELD-WEN double-paned wood windows you will enjoy the lovely oak trees outside. The kitchen is a cook's d"
"This captivating modernized Andalusian-style Spanish in Chevy Chase sits on an estate-like double lot with swimmer's pool, jacuzzi, and park-like grounds. Truly a home that should be seen to be fully appreciated. Situated across from the recently renovated Chevy Chase Golf Course, this home incorporates the beautiful surrounding views throughout. Complimenting the updated four bedrooms and three bathrooms are a delightful kitchen. Living room features a classic vaulted beam-ceiling. The master b"
"Welcome home to this lovely oasis with its oversized front porch, complete with a swing, immediately relaxes you and takes you away from the hustle and bustle of the city. Abundant light with large window creates a park like feeling and brings the outside beauty into each room. The elegant formal living room complete with wood burning fireplace allows for gracious entertaining with easy flow into the den and formal dining room. The updated kitchen has a sunny breakfast nook and the adjacent pant"
"First time on the market in 25 Years. 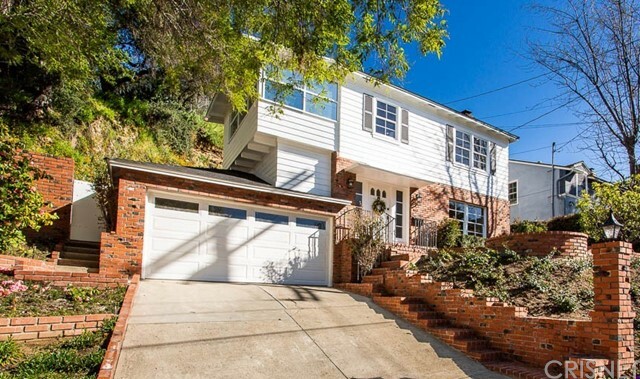 This 3 Bed 4 Bath Mid Century home in upper Chevy Chase canyon sits on a very private and mostly flat 39,433 square foot lot. With commanding unobstructed 270 degree views of Chevy Chase Country Club, and the entire canyon below. The entry opens to a spacious living area which contains the living room with fireplace and dining room. Floor to ceiling windows with spectacular views from both rooms.The cozy den has it's own fireplace. 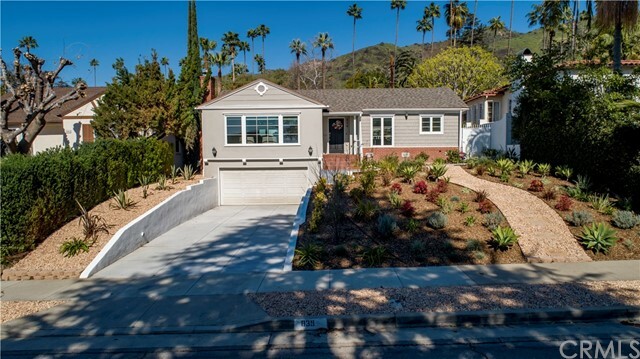 Nicely remodeled kitchen w"
"Stunning Spanish style home in a prestigious neighborhood of Glendale. The kitchen, the flooring and some of the rooms have been upgraded in last couple of years. Large backyard perfect for entertaining with playhouse for kids, spa, built in barbecue area and pizza oven. Finished extensive attic for lots of storage. Detached from the main house there is a home theater and a in-law suite. The property offers a surround system in all rooms, alarm system, tankless water heater and central vacuum sy"
"You want a home of gracious proportions and historic, architectural style. The original owners must have been well to do- they included expensive features like the peg and groove floors, multiple stepped archways, fireplace alcove and Renaissance Palladian windows. The formal dining room has grand proportions and opens to the charming covered morning patio. 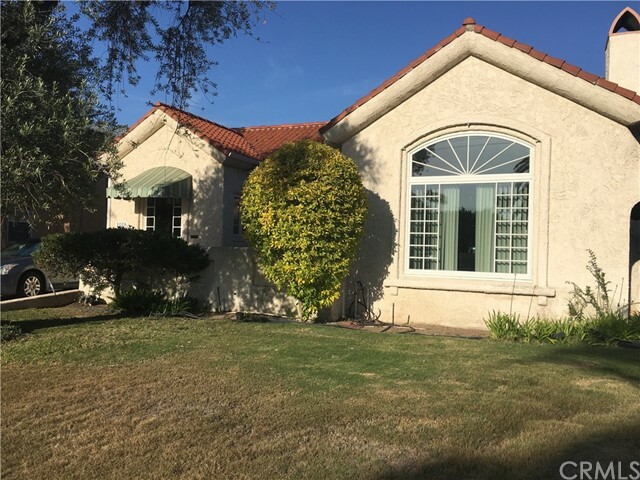 The first floor includes 2 generous bedrooms, full bath, den, large breakfast room (currently used as an office) and formal Living and Dinin"
"Gorgeous two-story Mediterranean style home located in Rancho San Rafael of Glendale City, minutes from Downtown LA and Glendale City College. Property was upgraded and well-maintained by the original owner. Property features spacious 4br+3ba(up), 1bd (office w/double door) +1ba downstairs. Has huge master bedroom with his and her closets, separate shower and tub, vanity w/ double sinks. Newly painted, 2 fireplaces and 3 car garages. 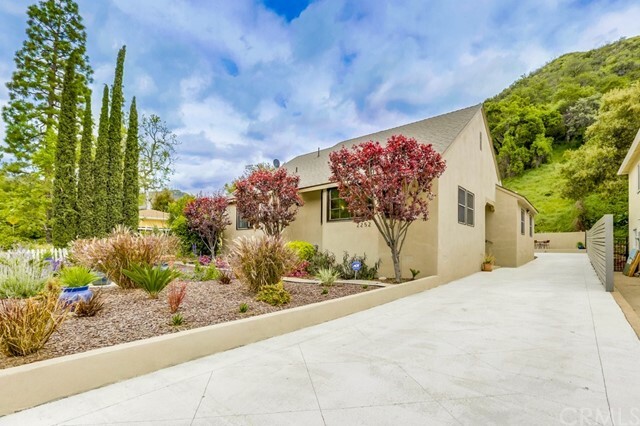 Large living area and dining area with high vaulted ceilings a"
"Beautifully renovated home nestled in the desirable Glenoaks Canyon area of Glendale. This 2134 square foot home features 3 bedrooms and 2.5 bathrooms. Enter your new home and relax in the light and bright, open concept family entertaining area with gorgeous engineered hardwood floors, recessed lighting and airy windows. Enjoy a cozy fire in the spacious living room that leads to one of two outdoor patios where you can enjoy the calming sounds of nature around your built-in fire pit. The upgrade"
"This house is being sold as-is. No repairs will be made. Current inspection report is available. Buyer should verify all information prior to the close of escrow." 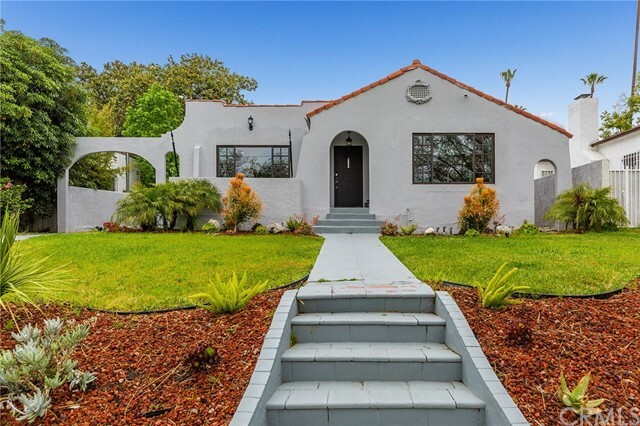 "Welcome to 1231 Cordova Ave, a 4 bedroom, 3 bathroom Spanish courtyard home with bubbling fountain in the Rossmoyne neighborhood. Upon entering, you will notice the spacious living room with Douglas Fir moldings, beamed ceilings and a fireplace with decorative tiles. The adjoining dining room with French Door windows leads to a kitchen with Corian counter tops, hand blown school house light fixtures and top of the line appliances. A family room and breakfast room with coved ceilings along with o"
"JUST REDUCED!! Perched high in the San Rafael Estates, this beautifully updated & meticulously maintained 3 bedroom, 2 bathroom home features an open floor plan which is perfect for entertaining, hardwood floors throughout, slate foyer & kitchen floors, tile bathroom floors, wood/gas native stone peninsula fireplace in LR/DR, double glazed windows, custom wood window plantation shutters, custom sliding rail bamboo panel and drop down window screens, recessed lighting throughout, remodeled kitche"
"Beautiful traditional architecture with a contemporary interior design. 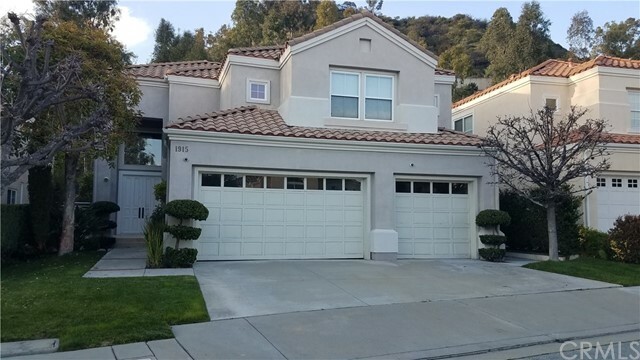 This is a 4 bedroom 2.5 bath home located in the desirable Chevy Chase Estates Canyon of Glendale. Short distance from Chevy Chase Country Club, Glendale Galleria, LA Zoo, Griffith Park, Descanso Gardens, Dodger Stadium, Downtown Glendale and The Americana. Great for entertaining both indoors and outdoors. Property was totally remodeled in 2008 brought down to wood studs and recently updated. Property has wood dual pane wind"
"This secluded, wonderful horse property has a 2 stall barn with large in & outs and tack & feed room. 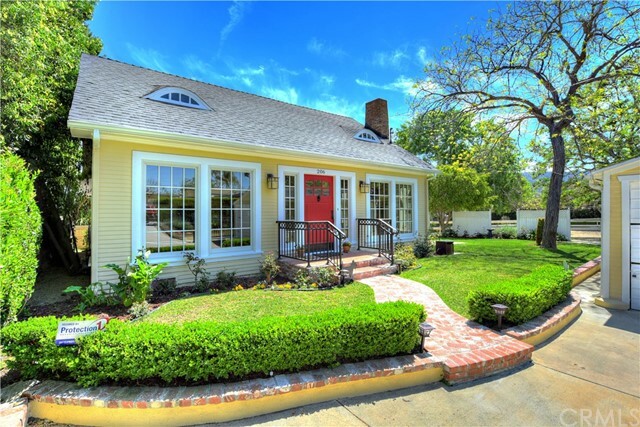 The home, built in the '20's, is pristine and authentic with original craftsman wood moldings. 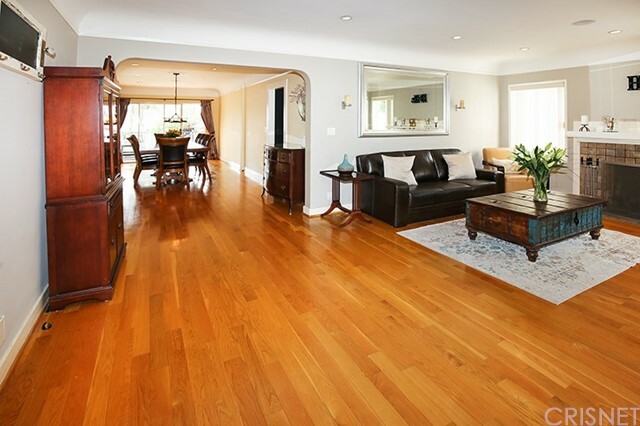 Huge living room with fireplace, spreads across the entire front of the home, offering 2 separate seating areas. Large formal dining room opens to a wonderful, sunny terrace for outdoor dining Dining room also opens to a light, bright eat-in kitchen as well as a serene library with lots of natural ligh"
"Welcome to 3050 Menlo Drive in the highly desirable Montecito Park neighborhood of Glendale. Originally built in 1925 and then enhanced by Viennese-born architect Rudolf Michael Schindler, this home exudes charm with its English Storybook style. Upon entry, this two-story home is welcoming and full of character. The formal living room is complete with a beamed ceiling, period windows and an original fireplace. The formal dining room is situated off the living room with access to an eating nook, "
"You can feel the pride of ownership as you enter this 3 Bedroom, 2 Bathroom Prime Northwest Glendale Home which is just a stroll away from Kenneth Village. Tastefully and extensively remodeled, It features an open kitchen with stainless steel appliances, a skylight and a large center island to gather around for those interesting conversations. Abundant light throughout the open and flowing floor plan. Private and isolated master suite with a large closet that has ample room for your goodies. Ene"
"****Bring your offers *** PRICE ADJUSTMENT **** SELLER MOTIVATED TO SELL. 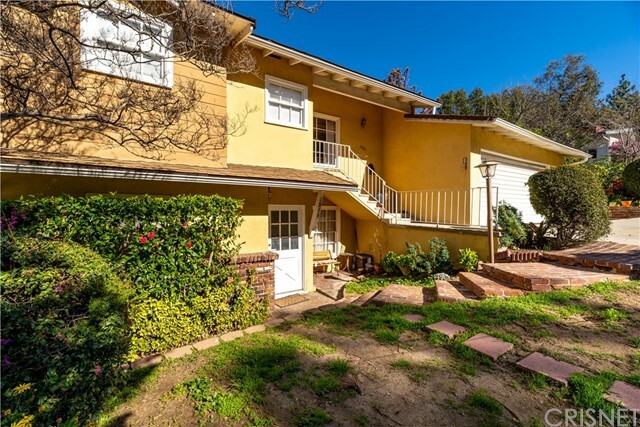 *** 1879-1881 Verdugo Loma Dr. ***Duplex, Duplex**** Located in the Rossmoyne & Verdugo Woodland area of Glendale resides beautiful Duplex- Hilltop with canyon views. Each unit features 2 bedroom, 1 bathroom with spacious living room. Wood floors- both units have private balcony with space for patio furniture and BBQ. 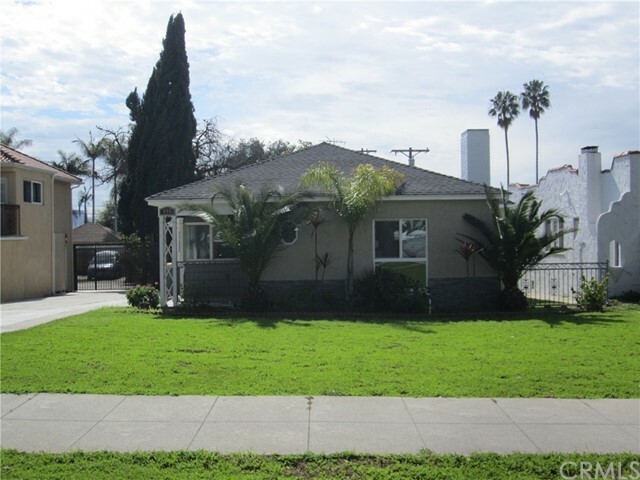 Property centrally located near Glendale Community College & Historic downtown. Great investment property." "Pride of ownership. Very unique property with two parcels as one with R3 Zoning, and 7,880 square feet lot size. Bring your imagination to create multi units or enjoy its existing use with plenty of recreation areas and parking space.Property line goes from Green St to Reeves Pl, it features 3 bedrooms 2 baths, Central AC / heat, living room, formal dining room, detached 2 car garage with fire sprinklers system, Large Paved Stone driveway, all new double pane windows throughout the house, SOLAR "
"This lovely 2-story home in the coveted Rossmoyne neighborhood has 3 bedrooms and 1 full bathroom on the main floor, plus a master bedroom retreat and bath upstairs. One of the bedrooms on the main floor has been used as an office with built-in wood shelving. The upstairs master bedroom offers a fireplace and mountain views. The home features: an updated kitchen with a walk-in pantry and breakfast nook; a separate entrance from the front patio into the formal dining room; 3 beautiful vintage gas"
"This 3BR/2BA 1,772 sq.ft. Spanish Revival home with an endless pool is located in Rossmoyne, Glendale's most coveted neighborhood. This romantic home has retained its original charm via thick hand-troweled stucco walls, arches, coved ceilings, exposed beams, vintage bathroom tile, and a kiva fireplace in the living room. Casually dine in the updated kitchen or have an intimate gathering in the formal dining room. The walls have been updated with insulation and solar panels minimizing the electri"
"BEAUTIFUL REMODELED POOL HOME LOCATES IN THE PALM TREE / NICE AREA OF GLENDALE. NEW STAINLESS STEEL APPLIANCES. NEW KITCHEN COUNTER TOPS. NEW LIGHT FIXTURES. CROWN MOLDING. RECESSED LIGHTING. REMODELED BATH. REFINISHED HARDWOOD FLOORING. CENTRAL AIR AND HEAT. DOUBLE-PANE WINDOWS HUGH FAMILY ROOM. WALK DISTANCE TO SCHOOL. EASY ACCESS TO SHOPPING AND FREEWAY. MUST SEE TO APPRECIATE. SHOW AND SELL." "Brand New construction, 6 modern luxury townhomes with chic interiors and easy access to work and play. Walking distance to THE AMERICANA AT BRAND/GLENDALE GALLERIA, Schools, and easy access to 5 Freeway. Located only 6 miles from Downtown Los Angeles."